On diversity, design methods, and shaping the future of an emerging technology. Every day we read about new developments in Artificial Intelligence (A.I.). Significant advances in machine learning, natural language processing, image recognition, and a myriad of other A.I. technologies are being used to solve previously insurmountable problems. And although these technologies are still in their infancy, there is a strong belief that they will radically disrupt much of how we see and engage with the world. There is a seeming inexorable march of this technology, with near-future uses that border on the fanatastical. But A.I. technology’s futures are neither inevitable nor singular. Technology is human — it is developed and advanced by the people that create, use, and promote it. This enables a wide range of simultaneous discoveries and innovations — from the broad initiatives of businesses and governments, to the experimentations of researchers and makers. These, in turn, inform, inspire and guide how technology is advanced, and where our cultural, civic, and businesses resources and efforts are prioritized. Technologies embed these priorities. They capture, often in subtle or invisible ways, frequently unintentionally, the cultural beliefs and aspirations of their creators. Unchecked they can embed and reinforce bias. And it’s why initiatives such as STEM/STEAM are so important — they increase diversity and break monocultures. Bringing new voices into technology, and getting them proficient in the possibilities and languages of that world, is an important step. It broadens and diversifies how technology thinks about how it is used, and considers what is possible. But it is a slow process, and A.I. is happening fast. Over the next few years A.I. is poised to be at least as disruptive as previous technological shifts such as the personal computer, the internet, and mobile tech. It probably will be significantly bigger. We need every voice shaping what A.I. will be and what we want to do with it. And we those voices now. Technical mastery should not be a requirement for participating in building our collective future. But it frequently acts as a barrier to meaningful engagement. How can we empower other disciplines and communities to understand and contribute to what A.I. technologies are developed and how they are utilized? Frequently businesses look to apply new technologies to their largest or most profitable sectors, or to support existing customers. But scale is not a requirement for innovation or driving technical progress; cultural engagement and the popular imagination are just as important. And it is often the outlier or unexpected uses that generate the most interest and advance the technology the fastest. Design can be a powerful means to discover alternative, unexpected, and innovative ways of using A.I. Design acts as a catalyst — a way of asking what we want from new technology, and imagining how it might manifest in the future. It allows us to give form to diverse ideas — before committing development resources to them — so that we can consider their implications. Existing design methods can be a starting point. But these methods aren’t static, they evolve and change, particularly when a technology emerges that triggers a paradigm shift. As A.I. becomes established, we will undoubtably formalize new methods. But right now we need to be experimenting, exploring, and questioning — working in cross- and anti-disciplinary ways to consider new ways of thinking, sketching, prototyping, and developing. By engaging a multitude of critical, social, and political (agendas and) voices with technologists and developers we can actively participate in shaping A.I.’s future roadmaps. For If we don’t participate, we risk falling victim to the unwitting consequences. A.I. has a long path ahead of it, with, perhaps, the ultimate goal of an artificial general intelligence (AGI). And while there’s a great need for visionary and speculative design to explore and debate AGIs, it’s critical for design to be engaged with the development of today’s near-term A.I. For it is through this partnership that we can make measurable and meaningful change. Uses. These are the purposes for which we use A.I. technologies. The goals, services, functions, or outputs. From medical advice to music creation, they’re what we aspire A.I. to help with, or to do. Interfaces. These are how we interact with, or experience, “the uses.” Voice, visual, emotional, they’re the inputs and the outputs, the thresholds between us and the underlying technology. Tools. These are how we create and maintain “the uses” and “the interfaces.” Authoring tools, programming languages, and frameworks, these are the core of how we develop the A.I. and deliver the interfaces. Top Down. The strategic, needs-based, and futuring work that informs and drives the development of projects and technologies. Bottom Up. The iterative and incremental research, making and experimenting that advances what’s possible right now. Across all of these areas and approaches design has an important role to play. From discovering new uses, to creating new tools that broaden the development community. From participating in the strategic conversations that inform top-down approaches, to making and supporting research that are part of the bottom-up work. And all the while, considering new ways of doing the work, and new ways to engage diverse viewpoints and stakeholders. As A.I. becomes embedded in new design methods and tools it’s likely that this framing, and the relationships portrayed, will change. Or A.I.’s differences may render existing metaphors, approaches, and examples irrelevant. It’s why we need to consider new ways of doing things; and new ways to engage diverse viewpoints and stakeholders. What I’m writing here isn’t new. There are already a lot of great conversations happening about how we can bring new voices to the table to participate in A.I.’s development. This is just another call to action. To encourage more collaboration across all disciplines. To find new ways of imagining and communicating new uses, tools, and technologies. And to support more sharing of who we are, what we’re doing, and how we’re working. If we’re successful, the results will be more than just better designed A.I. We will be designing what A.I. becomes. 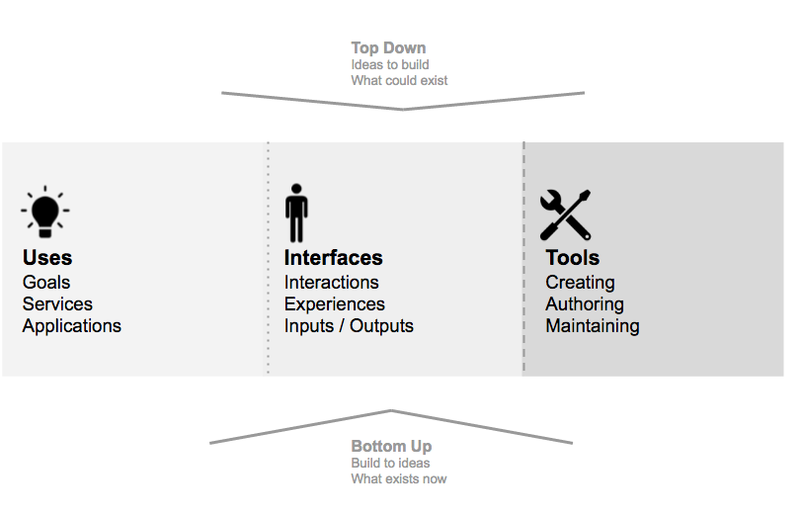 This post was also published here on my blog Inventing Interactive. If you found this post interesting, take a second and like it with the heart button below. If you want to read more by the author (me) or this topic use the follow buttons.